I’ve been figuring the economics of producing our own electricity for the last week since we finally saw our daily output sail just over the 10 kilowatt mark on January 31. It was exciting, a combination of the sun’s steadily rising trajectory across the winter sky, a perfectly clear day, and very cold air that had the photovoltaic cells producing at their maximum. The end of January also marked the end of six months since the system went into operation and allowed me to do a little math. We currently pay Public Service of New Hampshire 8.8 cents per kilowatt of electricity we use. Since the electricity we produce gets fed directly into the power grid, causing our meter to run backwards while our cells are creating electricity, our power is worth the exact same 8.8 cts. per KW. I crunched the numbers and then projected them over a full twelve months--it looks like our annual production will reduce our electric bills by around $154.40. Of course, there are a large number of variables: seasonal shifts in the weather, for example. We’ve haven’t seen how the system works in late winter, spring and early summer yet, and one year may be quite different form another. Still, I know that in the six months and five days from the day we went into the power business until Tuesday when logged 900 KW total produced, we’ve made $79.20 worth of electricity. A couple of weeks late, we’ve finally had our “January thaw.” The temperature has been in the mid to upper 40s the last two days and with some sun in the afternoons, there’s been a lot of melting. I was in Boston two days last week. Tuesday night there was a very strong performance of Verdi’s opera Simon Boccanegra in concert form by the Boston Symphony Orchestra. Vocally quite glamorous (soprano Barbara Frittoli, tenor Marcello Giordani and the distinguished Belgian baritone Jose van Dam in the title role), Boccanegra is a political drama set in 14th century Genoa. A lot more compelling than it may sound, the opera concerns itself with a power struggle among the Boccanegra, Grimaldi and Fieschi families. Had the action of the opera occurred just a little later in the century, a fourth family--my family--the Fregosi would have been in the cast list. But it wasn’t to be. 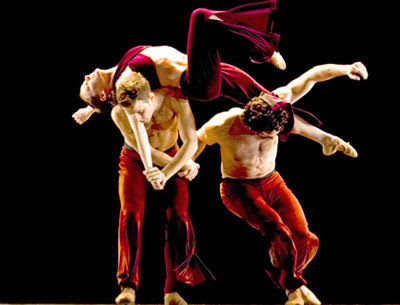 Friday night the inventive, witty and very elegant Hubbard Street Dance Company from Chicago sold out the Majestic Theater in a delightful program filed with the joy of performing. Visually, I think the one above is my favorite this year. Those wind chimes are a work of art! The amaryllis is definitely beautiful! My grandma would love that! Wow, I love the wind chimes. And yet once again, we were in the same place -- we also attended Hubbard Street Friday night. Wow -- I loved it way more than the Globe reviewer did, but the reviewer and I did agree that the last piece (the one to Bolero) was magnificent. Sorry to miss you! How much did the solar system cost to install and maintain? When will you start showing a profit so to speak on the install and upkeep of the system? The entire cost--all equipment and installation--was ballpark estimated at $25,000 when we first talked with KW Energy Management in person but came in at $18,500 in the written estimate which is what I wound up paying. I won't know exactly how much I make in dollar terms until I've been through a full year cycle (which will end in the last week of August of this year). Only then will I know how long it will take to pay for itself. That, however isn't why I did it--because I don't think I'll ever see that day. I did it because I believe in it and because I wanted to use it as a teaching tool, which is happening. Maintenance costs us nothing. The only maintenance we have to do is remove snow from the panels and they mostly do that themselves, shedding snow, particularly heavy snow, due to their 43 degree angle and glass surfaces. I will be posting on the economics at intervals as more figures become possible to give. We recently talked about putting solar panels on our roof, especially since our energy costs are ridiculously high. The cost numbers didn't look too bad, especially with rebates and tax credits, but then some practical issues got in the way. For example, we expect to replace the roof in the next 5-10 years. Well, if the solar panels are sitting on it, that's going to be quite an issue. Then a few other practical issues piled on that and killed our interest in it, at least for the moment. We'll see what the future holds! Jess, check out a new extruded plastic sheet product that has the photovoltaic cells embedded in it--It IS the new roof covering, taking the place of shingles. You could reroof your house with your solar panels and every square foot would produce electricity. That sounds very cool, Will. Thank you for the tip! Now I just have to see if I can track that stuff down! These are delightful in their artistic specialness.